Common, Andrew Ashong & Theo Parrish, Palov & Mishkin, Jay Dee ( J Dilla), Red Astaire and more. The Mixcloud crew were out in L.A. last month, so whilst they were in town we teamed up with our extended U.K. family for a dope all-day DJ jam. The Mixcloud in L.A. party took place on Saturday 25th May down at the DV Shop (6611 Sunset Blvd) with great music, plenty of drinks, and classic Cali good-vibes. On the turntables we had DV crew residents, including Chily T, Cee Brown, and Cazal Organism, plus friends from Soulection, Team Supreme, The Melt, Soul Circle Radio and more, all serenading Sunset Boulevard with the dopest of DJ sets. The event was live streamed via DVTV, and, for the past few weeks we have been sharing the various recordings with Mixcloud listeners. 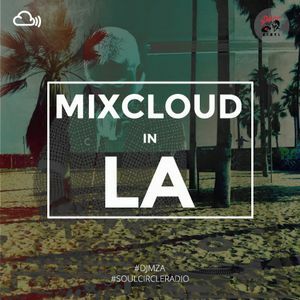 Now, for the fifth Mixcloud in LA recording, we have DJ MZA from Soul Circle Radio spinning some chilled vibes and mixing up some very special tunes for you to enjoy.